Here's an interesting little book that can enhance your experience of visiting, or viewing, kunanyi/Mount Wellington. Our mountain has a fascinating natural history, and was part of Aboriginal life before the arrival of Europeans. Since then, it has been climbed, documented, recorded and depicted in many ways. 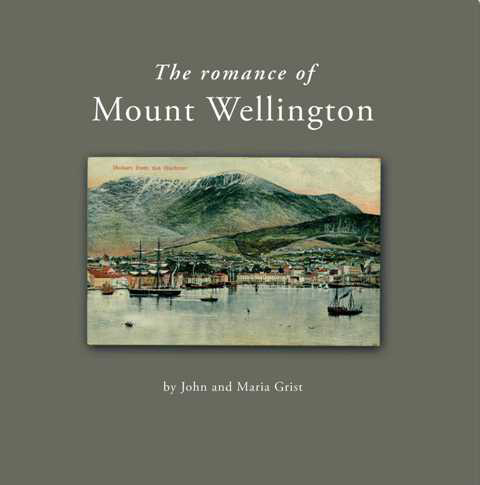 In the words of John and Maria Grist, authors of The Romance of Mount Wellington, "Mount Wellington has always been an important part of the life of those who live in the city of Hobart, which nestles in its shadow". Undoubtedly this it true. The mountain is a constant companion to the city, providing a bush and alpine playground within a short journey, a place to connect with nature, and a natural environment unlike those accessible from any other Australian capital city. It stands above the city, defining its boundary, and identifying it immediately. Here you really can go from the surf to the snow within half an hour, and you can see the surf from the snow. The Grists have added to an extensive bibliography with this book. The pictures are mostly taken from their extensive collection of postcards, along with their own photographs of places and features. The original postcards are intriguing and revealing, dating back into the late 1800s. If you're familiar with a particular location, you will notice either the continuing similarity, or just how much a place has changed. Sometimes both. For unfamiliar places, the book tends to excite exploration and discovery. I first saw the skating rink in this book, and have since "discovered" it, just off the road a little below the pinnacle. If you didn't know it was there though, you'd never suspect it, and this is part of the mystery, and yes, perhaps the romance, of Mount Wellington. The book left me wanting more information about many of the featured scenes and places, but perhaps that's its purpose. You can buy The Romance of Mount Wellington at various Hobart bookshops - Fullers, The Hobart Bookshop and Dymocks come to mind. The book is published by Wellington Bridge Press, and can be purchased directly from the authors here. For those wanting deeper information about some of the historic aspects and sites on the mountain, these documents provide very useful information. Note that sensitive sites are not necessarily accurately located, to reduce the likelihood of damage by fools.